Ol' Myrt here has previously mentioned Maureen Taylor's new Revolutionary Voices film project. For those of you who are still thinking about this, the time is now to make your decision to support this documentary film. When Maureen first sought copies of verified American Revolutionary War soldiers and sailors, I figured it would be a lost cause and that at best she would end up with five or ten images. But Maureen has found significantly more in her sojourn as the photo detective. Fortunately, a surprising number of servicemen survived long enough for the emergence of photography to take place in the early to mid-1800s. It is a miracle the fragile ambrotypes, daguerreotypes, and tintypes have come to light in the 21st century. 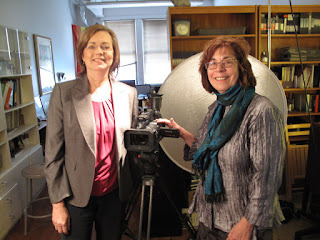 This is a pic of Maureen and her film director Pam Pacelli Cooper of Verissima Productions as they contemplate the production of this one-hour PBS-quality production titled “Revolutionary Voices: A Last Muster Film” www.lastmusterfilm.com, will introduce authenticated photos of members of the American Revolutionary War generation. There are over 200 photographic portraits that have been discovered and compiled by internationally recognized photo identification expert Maureen Taylor over the past decade and profiled in her Last Muster books Images of the Revolution and Faces of the Revolution. Maureen explains "In order to produce and distribute “Revolutionary Voices” we need to raise a total of $225,000. Together we already spent numerous in-kind hours in pre-production. We need this initial funding to get our project up and running. As with any film our biggest challenge is starting production. We are seeking $27,500 through your pledges to begin shooting. “Revolutionary Voices” is not just the culmination of a professional project, but also a labor of love. Our passion is being able to share the stories of these extraordinary people. By becoming a backer of “Revolutionary Voices” you will help shine a new light on this on this vital, but sometimes remote, chapter of our American experience." Your payment will be processed through Amazon.com checkout on April 10, 2013 as I'm sure this Kickstarter fund request will surpass 100%.